Local Facilities: The nearest supermarket is a Tesco which is less than a 5 minute drive off the main A3074 road in to St Ives. There are also banks, hairdressers, a chemist, a post office newsagents and general stores all a short walk away. During the day when on the beach there is a cafe, shop and food outlet. Attractions: A great location for couples and smaller families. Carbis Bay really does give you the best of both worlds. The peace and quiet of Fernhill yet only short distance away from the vibrant town of St Ives. Further a field Penzance, St Michael's Mount, Lands End, beautiful Sennen Cove (surfing), Padstow (cooking courses with Rick Stein), Port Isaac (filming of TV show Doc Martin), Newquay (indoor Water World), & St Austell (Eden Project) are all within easy reach either by Car or Train. Other Activities: Live theatre, cinema, Tate Gallery, museums, bars, restaurants, clubs, and shopping. A bespoke wet room with contemporary fittings, WC, wash basin, heated ladder towel rail, under floor heating, and open shower with further handheld attachment. Towels, tea towels and oven glove are provided. Pretty enclosed garden with hand rail coming down a gravel slope. Also seating for 4. Decked terrace off from the master bedroom with wonderful sea views. The apartment is situated on the ground floor and is accessed down a gravelled slope with hand rail. It has a private paved patio boarded by Cornish stone walls and a decked area with garden furniture. There are communal gardens and a private pathway down to the sea. Plus the added benefit of an allocated parking space. This was one of our most enjoyable holidays, the apartment has stunning views over the bay , is very well equipped very thing you could need has been thought off . The location is very good close to the costal footpath and there’s a train station too , we will be returning again soon . It was a pleasure to have you come to stay and I am so pleased you enjoyed yourselves and loved the apartment and its special location. So pleased you enjoyed your stay. Thank you for your lovely 5 star review! Lovely property with excellent facilities. Stunning views in a quiet location away from the hustle and bustle of St. Ives. Only a short 20 minute walk from the town. Lovely garden with plenty of seating area's. Saw stunning sunrise each morning overlooking the bay. Suutable for a family or a couple looking for a peaceful escape from the stress of the City life. The flat was clean, well maintained with a well equipped kitchen. Close to coastal walks and beaches with train station and bus stops nearby. We enjoyed a fantastic week here and would definitely try to book again next time we visited this part of Cornwall. Thank you for your amazing 5 star review! I am so pleased you had such a fantastic week at Seaside Apartment and you enjoyed everything the apartment has to offer and it's location and views. Lovely property,clean and comfortable and very well equipped. Large spacious garden. We were lucky enough to have a warm,sunny week enabling us to make the most of the garden. The garden belonging to this property is the largest and most private and has the sun from dawn to dusk. Thank you for such great 5 star review! I am so pleased you enjoyed your holiday at Seaside Apartment and you that you found it clean, comfortable and well equipped. The private garden to the apartment is lovely to sit out in and definitely an added benefit. Thank you for your great 5 star review! I am so pleased you had a wonderful holiday. 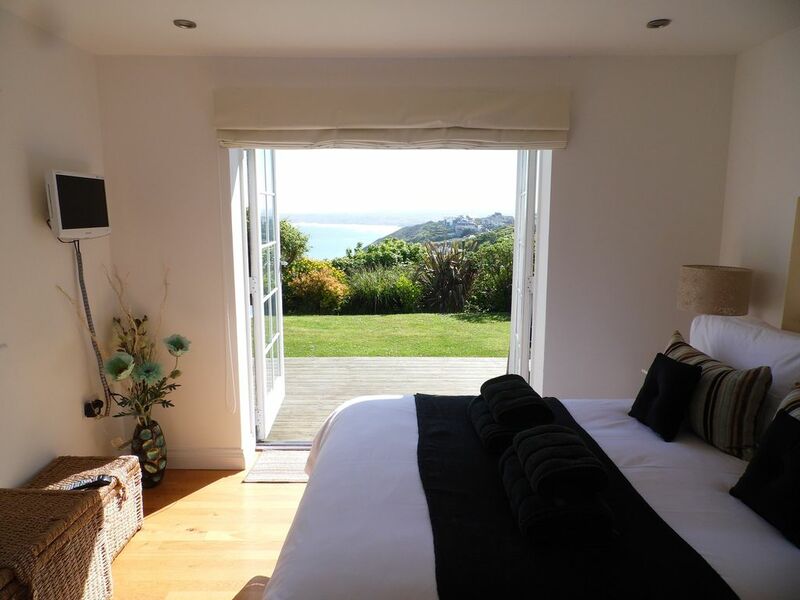 Seaside Apartment is a stunning bespoke, luxury holiday home which is located in a pretty and quiet area of Carbis Bay. Just minutes from the turquoise waters & white sands of Carbis Bay Beach, guests have everything they need for a truly amazing holiday! This wonderfully light and well equipped apartment is part of the Fernhill Development which occupies a superb position with truly fabulous sea views across to St Ives Bay & Godrevy Lighthouse. Carbis Bay is less than 2 miles away from the picturesque harbour side town of St Ives. You can walk into town in around 15 minutes along the beautiful coastal path or walk in the other direction to the village, beaches, sand dunes and golf course of Lelant. Historic St Ives is renowned for it's cosmopolitan mix of restaurants and cafes, art galleries, beaches and scenery and whether you are simply looking for a week on one of the many beaches or an energetic mix of surfing, golf, walking or diving there is something here for you. We accept online payments a 50% non refundable deposit due straight away and then the remaining 50% is due again 60 days prior to your holiday start date. Full rental cost is payable for bookings made less than 60 days prior. Main changeover day is a FRIDAY Flexible changeover days & short breaks available please contact owner for details. Cancelled bookings will not receive a refund.